Because technology is used widely in work, community, and school environments, The Vista School continually seeks ways to provide access to technology for students. Generous funding from The Vista School PTO recently enabled Vista to further this goal. “Our original goal was to secure one iPad per classroom to utilize for reinforcement,” said Candis Chubb, education director and special education supervisor. For instance, student use of an iPad for leisure-time activities can be offered as reinforcement for demonstrating a targeted behavior, such as responding to a demand within three seconds. 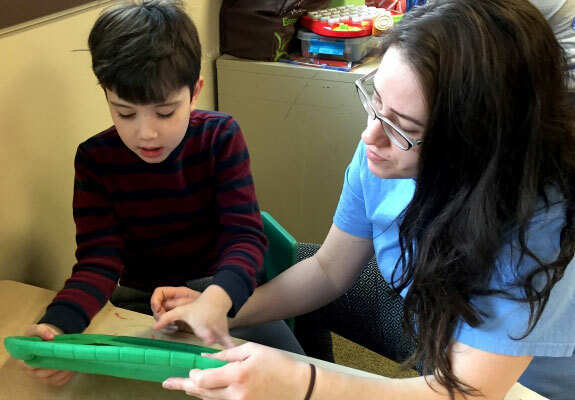 Melissa “Mo” Grumbein, curriculum coordinator, said Proloquo2Go allows for a continuum of communication between students and teachers, from staff modeling the use of language to students using language to communicate independently or with staff support. An app is also available for Early Literacy Skills Builder (ELSB), a curriculum used in many classrooms at Vista to help students to develop literacy skills. In the ELSB curriculum, the teacher goes through a series of steps to introduce new vocabulary words and comprehension skills. The curriculum is mostly used in traditional book form. However, when the teacher takes out an iPad, Grumbein said students are often motivated to engage in instruction. For example, in one of Vista’s elementary school classrooms, the teacher introduced the words “me,” “friend,” and “is” to the students using the ELSB app. After two exercises, students were asked to identify the word in a sentence. With each correct answer, the teacher would say “yay” and reward the student with a high-five.